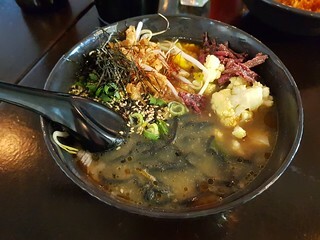 I Like Ramen started as a weekly vegan pop-up down the coast, then got a permanent little kiosk at Love Child Miami (which I have visited once), then a pop-up in Brisbane, and finally its own permanent vegan venue. I visited one Saturday evening with some friends to check it out. We started out sharing the Panko Mushrooms with a sour cream and garlic seasoning and aioli. 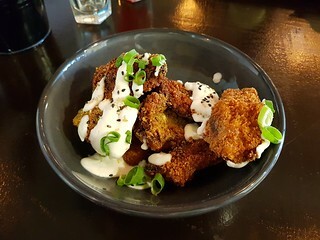 I couldn't taste the seasoning much, but the mushrooms were crispy and tasty, though I wish there had been just a bit more aioli. 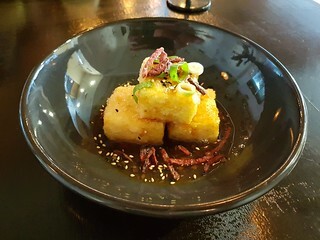 Also on the small plates menu, Agedashi Tofu. This was very tasty, but it was not agadashi tofu. The shiitake dashi was quite tart, and not at all like a traditional agadeshi broth. Given all the other food we ordered, I was worried that I wouldn't have room for this, but it was quite a small serving, only three pieces. 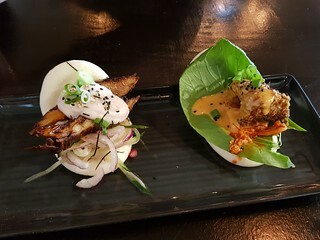 My friend ordered both of their bao options - Panko Mushroom and Kimchi Bao (with panko crumbed mushroom, bok choy, kimchi, and sriracha aioli) and the Holy 'Duck' Bao (crispy "duck" glazed in plum sauce, cucumber, mint and pickled daikon slaw with chilli lime dressing and pomegranate mayo). I also had the duck bao, but without the chilli lime dressing. This was really nice, though it came with a lot of raw onion that I picked out. But what about the Ramen, you ask? Never fear! I ordered the Cauliflower and Onion Ramen (activated charcoal noodles served in a cauliflower and onion broth with crispy beetroot, charred corn and cauliflower), because you know I could not say know to the amusing charcoal noodles. This was really tasty, though the crispy beetroot gets soggy very fast in all the steam and broth. 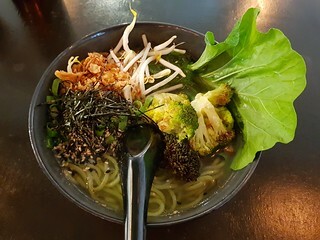 My friend had the Mean Green Ramen - spinach ramen noodles served in a clear vegetable broth with fresh bok choy and wakame, finished with seared broccoli, chopped spring onions, fresh sprouts, fried shallots, roasted seaweed, chilli threads and sesame. Green noodles! Very fun, and also gives you a good dose of green. I'm keen to go back at some point to try some of their other small plates, as well as some other ramens. Their Chick'n White Miso Ramen is meant to be the most popular. They didn't have any sweets there when we visited (now they have desserts on the menu, more reason to go back! 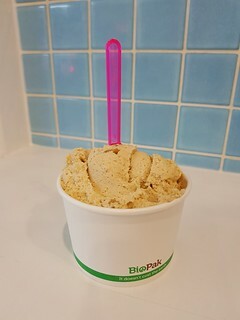 ), so we visited Doughlord afterwards for some vegan cookie dough scoops. I got Maple and Hazelnut. 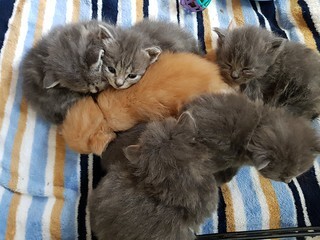 I know you've been waiting for more kittens, so here is they are in a cuddle puddle, a bit older than those first photos! I like a lot of dip/sauce too. I always make a lot thinking I'll have leftovers, but I usually use it all! The food looks gorgeous as usual. I want to live in the kitten pile! I love how the lobe ginger is right in the middle! Ginger bub really got the best, snuggly spot! Sorry this is totally random, but is it okay if i used one of your photos for my cookbook review? Also everything looks amazing. I am super jealous of all the ramen options!